ships’ behaviour : Container ships, due to the nature of their trade, are required to keep to very tight operating schedules. Maintaining the schedule is an important part of the liner trade. As a result, these ships have powerful engines, not only to provide the high speeds required, but also to enable speed to be maintained during bad weather. The consequence is that, at times, container ships can be driven hard. When ships are driven hard in bad weather, the loads on the lashings can be severe. There are many load components arising from a ship’s motion. These are discussed below. 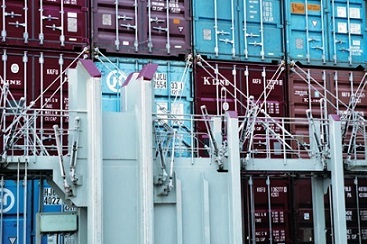 Ships’ structure: The combined weight of a stack of containers may amount to a total downward force on the tanktop, through each container corner casting, of up to 100 tonnes. When four container corners are placed close together, such as at the mid-hold position when carrying 20-foot containers, the total local load on the tanktop may be four times this load. During classification, the strength of the ship’s structure to support containers is verified and approved. This includes assessment of the strength of the tanktop, the cell guides and, on deck, the strength of the hatch covers, lashing bridges, pedestals and the fixed fittings associated with the container stow. It is important to carry containers within the loading conditions imposed by the classification society. Container loads should never exceed the limits set down in the ship’s loading manual. Container strength and ship motion: Although a ship has six degrees of motion, it is roll, pitch and heave which produce the most significant contributions to the forces on a container stow. Surge is important for road and rail transportation and containers are designed with this in mind. The motion of a ship in irregular seas is itself irregular and is impossible to accurately predict. Consequently, when calculating accelerations on a stack of containers, regular cyclic response is assumed in association with an assumed maximum amplitude. Empirical formulae for maximum amplitude and period of response are defined in the Rules and Regulations for the Classification of Ships by Lloyd’s Register. Rolling motion is dominant in the calculation of forces, but rolling must be considered in association with the other components of the ship’s motion to establish the largest likely combination of forces which the stow may experience. For calculation purposes, the forces acting on a container may be resolved into components acting both parallel to, and perpendicular to, the vertical axis of the container stack. Gravity acts vertically downwards and, therefore, when the stack is inclined at maximum roll or pitch, there are force components of static weight acting both parallel to, and with, the vertical axis of the stack. The dynamic components of force are vectors. These are combined algebraically with the static components. Lashing strength calculation software: Lashing strength of deck cargo shall be ascertained by using the appropriate lashing strength calculation software where provided. All resulting values for lashing strength must be within the tolerance limits prescribed by vessels classification society. Lashing strength calculation software provides alarms/highlights for containers that are affected by excessive forces. Such situation may be corrected by adjusting the vessels Ballast / Fuel condition or alternatively by advising Terminal planner / Central planner and having the cargo stow plan appropriately modified. In case any anomaly / alarm is noticed, the master shall notify all concerned parties and have the condition corrected at the earliest prior departure or at the next port as instructed by Vessel operator / Central planner. In such case, master shall also take this special case into account during maneuvering in heavy weather. If lashing strength calculation results are exceeding tolerance limits, failure of lashing gear or failure of the container itself may occur. Probability of this happening is highly enhanced in inclement weather and attendant heavy rolling, pitching or heaving. Each lashing gear component has a safe working load and is likely to fail if forces exceed this value. 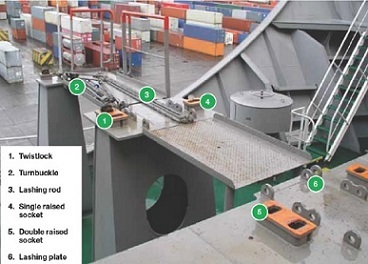 Failure of lashing gear components will then besides freeing restraints, also likely result in forces on containers exceeding tolerance limits. Sea freight containers are designed to withstand a defined minimum racking force, side wall racking force, vertical compression, vertical tension, corner post and shearing force at twist lock. Forces exceeding these defined minimum values (tolerance limits) will likely result in structural damage or collapse of the container. If one container in a stack collapses, it is likely that the entire stack will collapse. A lashing bridge is a fixed structure while a hatch cover will move when a ship rolls and pitches. The resulting effect could be that a lashing from a lashing bridge becomes slack or takes excessive load. A hatch cover is designed to move as the ship bends and flexes. A container stowed on a pedestal, a fixed point, will attempt to resist hatch cover movement if also secured to a hatch cover. 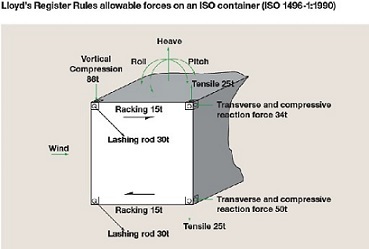 In theory, excessive tightening of lashing rods will result in the rods taking additi onal strain, which can cause rod failure when under load.Application of extra lashings can, at times, make the stow very rigid, causing large forces to pass to container-securing points and causing them to fracture. Movement of containers will result in some lashing rods becoming slack. Air temperature differences will cause the tension in the lashings to change. Lashings should be checked and tightened within 24 hours after leaving port and regularly thereafter. This is especially true before the onset of bad weather. Crossed horizontal lashings from lashing bridges will hold a container. However, the container will be held rigidly to the fixed lashing bridge. When a ship bends and twists, the base of a container attached to a hatch cover will move, but container ends held firmly to a lashing bridge with horizontal lashings will not move. The effect will be to put strain on the lashings and even break the bars or damage the container corner castings. Horizontal lashings should not be used unless specifically permitted in the approved lashing plans shown in the Cargo Securing Manual.